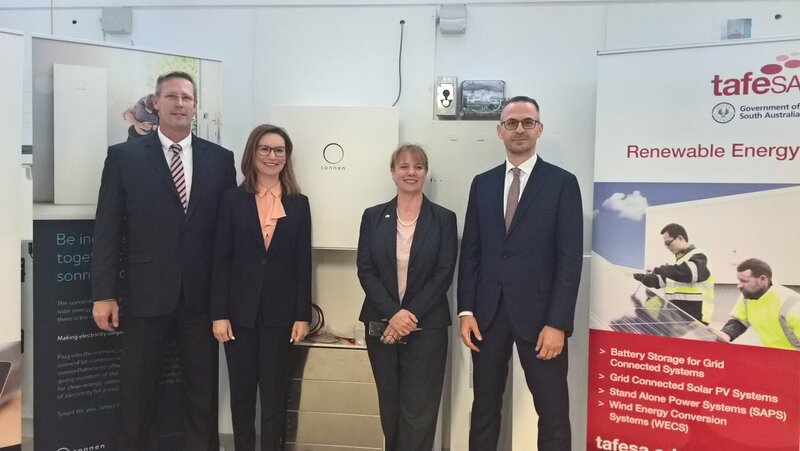 German battery storage company sonnen has selected TAFE SA as the preferred accredited training partner for installers of their battery system. Education Minister John Gardner said TAFE SA’s agreement with sonnen – which earlier this year announced plans to build a battery manufacturing plant in Adelaide – will ensure that local electricians are well placed to be accredited to install the new home batteries. Several sonnenBatteries have already been installed at TAFE SA’s Tonsley and Elizabeth campuses in order to boost its training capabilities. Mr Gardner said the partnership is expected to spark a significant increase in enrolments for TAFE SA’s renewable energy and battery installation courses, with extra training being offered to meet the demand. “Interest in TAFE’s renewable energy and battery installation courses continues to grow, and we expect this partnership to further increase demand for this training at both the Tonsley and Elizabeth TAFE campuses,” the Minister added. Minister for Energy and Mining Dan van Holst Pellekaan said the partnership will ‘further support the delivery of cheaper power to SA households’. Marc Sheldon, Managing Director, Operations and Finance of sonnen Asia Pacific was equally enthusiastic about sonnen’s new partnership with TAFE SA. Sonnen’s new manufacturing centre will be located at the former GM Holden site at Elizabeth. it will produce 10,000 batteries a year to meet demand from Australian households and for export to Asia Pacific markets.